UK Man Flu is Real! And to prove it there are now lots of Man Flu Novelty Gifts available in the UK to help us men overcome it. Girls, you probably don’t understand what man flu is because the ladies flu strain is considerably weaker. Man Flu is a serious condition that only affects the male population. Men have a different genetic design to women and the virus only attacks those parts. Higher levels of testosterone in men lower their immune system, which the man flu then targets. So whilst women may catch the same influenza virus it will react in their bodies differently. The woman’s immune system fights the virus more effectively resulting in the woman getting only a few minor sniffs and coughs. Typically though women are twice as likely to call in sick when these sniffles occur. When Man flu strikes the man it’s a different ball game. What are the Man Flu Symptoms? The man flu strikes men down in their stride and limits them to only being able to walk a few metres from the couch at a time. Normally this is to get the remote or take a wee. Women will normally scoff and make man flu jokes at this point. Men can be diagnosed if the following man flu symptoms are present. They will be suffering with extreme dizziness, sore heads, sweating, horrendously sore throat, runny nose and general weakness. His sore head will also be hurting his eyes and therefore he will be required to watch plenty of sport to cure it. Men are twice as likely as women to just ‘power through it’ and won’t pull a sickie unless it’s a case of Ultimate Man Flu. Your man will needs lots of attention and care during his personal man flu epidemic. Ensure he has easy access to the tv remote so as not to strain himself stretching for it. Lots of cuddles and reassurance will also be appreciated. Plenty cups of tea and coffee and when he is in the recovery phase you can start to re-introduce beer. 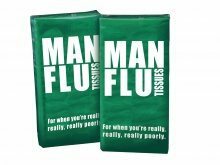 In addition there are now some man flu novelty gifts that will help him recover, if not fully, then these gifts will certainly bring a smile to his face. One of the most annoying aspects of man flu is the runny nose. With these specially designed just for Man Flu Tissues you will be able to keep the snot under control. Packaged in special man flu tissues wrapping, these essentials will fit in your pocket nicely so you always have one at hand should the man flu get too excessive. It is advisable to always have a few packets of these man flu tissues handy in a drawer at work, home or in the car, to hand out to any male friends or family should their immune system succumb to this dreadful virus. Whilst us men are suffering with the dreaded man flu it’s quite possible our breath is going to need freshening up . With a build up of itchy and scratchy mucus in the throat and a particularly bad blocked or runny nose, our breath will become a little stale. Man Flu Mints will help to freshen our mouths and release some menthol into the nasal passage to help us breath. 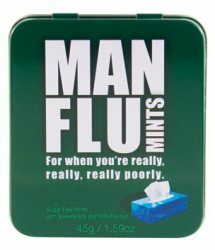 Man flu mints are a must for any victim and are a best seller in the novelty man flu gifts range. 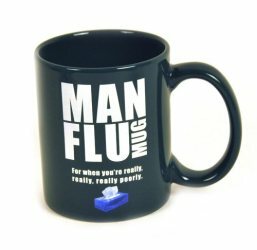 The Man Flu Mug will let everyone know your ill. In the office your man flu mug will not be used by any of your colleagues for fear they may to catch the dreaded man flu. An added bonus of having a man flu mug prominently displayed on your desk is that the boss will sympathise and either give you less work or send you home. At home the use of your man flu mug will inform your wife and children that you don’t merely have a run of the mill cold like they get, but are powering your way through the virus from hell with Beecham’s in your mug. What better way to let your male companion know you care and are taking his man flu serious than to shower him with Man Flu Chocolate. Instantly on eating these man flu chocolates, the man will begin to recover and start feeling better. 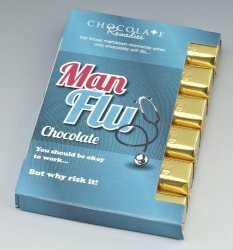 Specially designed just for men, women shouldn’t eat them or they too could get flu-like symptoms. 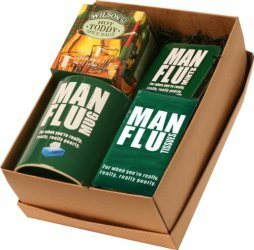 Instead of buying your man flu novelty gifts individually then this Novelty Man Flu Gift Set could be the answer. Let him know you care and understand that man flu is real. Recovery will be just around the corner I’m sure. Please note, this is not real man flu medical advice, if your ill, please visit the doctor. Don’t forget to check out all our other novelty gift ideas in your countries novelty gift shop above.